All Rights Reserved by Dr. Shinozuka. Jun. The following photographs show the Hopkinson's bar type experiment. 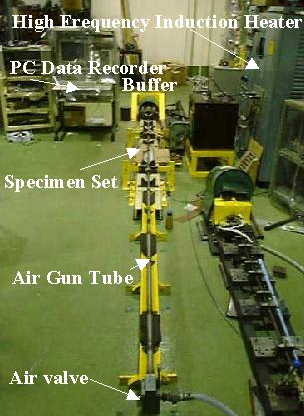 In this experiment, the incident bar collides with the input bar at very high speed with high compressive air. 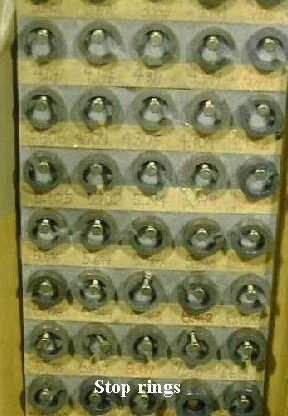 The cylindrical specimens, whose diameter is 6-8 mm, are used. 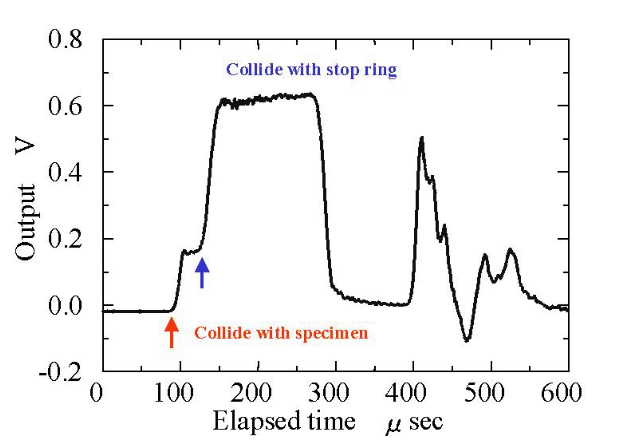 The the elastic wave develops and transmits to the specimen when the incident bar collides with the input bar. As everyone know, the magnitude of the stress ( in this case compressive stress ) is in proportion to the density, the magnitude of the sonic wave and the velocity of the material speed. 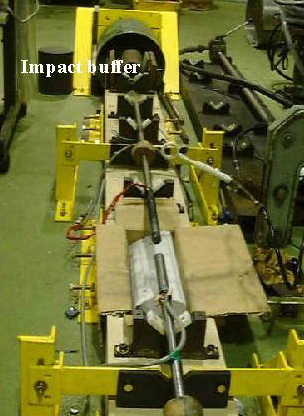 So as increases of the speed of impact, as increases of the magnitude of the stress. 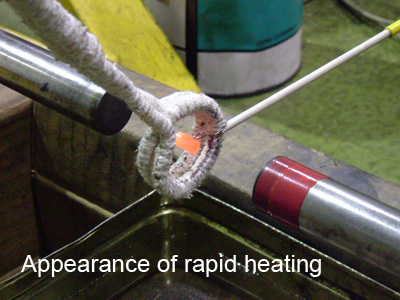 The temperature is raised rapidly with the high frequency induction heater. 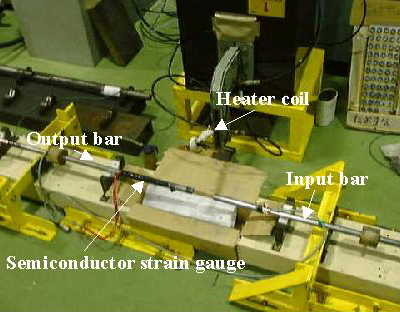 The heater coil is set to cover the specimen and stop ring at the moment the incident bar collides with the input bar. The material deformation is restricted with a stop ring in order to controll the increment of the strain. It is assumed that the strain rate and temperature does not change during this deformation. But to tell the truth, the strain rate is change due to material harding or softning and the increasing the sectional area of the specimen. Repeating this process, we can get a stress-strain curve for specific strain rate and temperature. This is one of examples of the output data of semiconductor strain gauge. There are two stages. In the first stage, the input bar collides with the specimen. And in the seocnd stage, the input bar collides with the stop ring. The strain is calculated with the change of the height of the specimen. The starin rate is calculated too. The compressive stress is calculated using the difference of output voltages between each stages. Tokyo Institute of Technology, Obikawa Laboratry All rights reserved 1998-2004. Featuring Dr. Shinozuka, Jun 1998-2010.